McDonald’s is releasing a line of Super Mario Happy Meals toys again — this time, they can help you win a Nintendo Switch. 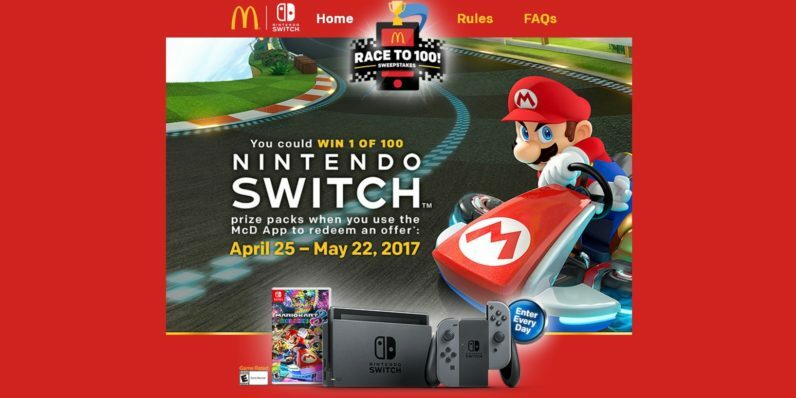 According to GameSpot, McDonald’s will be giving away 100 Switches bundled with Mario Kart 8 Deluxe between now and May 22. To enter the event, you either buy Happy Meals (with complimentary toys) or — if you’re feeling health-conscious and can’t see yourself eating a Happy Meal a day between now and May 22 — email McDonalds directly. The two chains have released these same toys before: back in January, McDonald’s ran a pre-release campaign for the Switch which included the same line. Now it’s cleaning out its unsold stock with this new promotion. The Nintendo Switch has been hard to find since its release earlier this year, and retailers warn that this isn’t likely to change any time soon. Depending on your tolerance for Happy Meals and spam emails, this could give just as good a shot at getting your hands on a Switch as checking Amazon obsessively during Nintendo’s next production run. Think about it: the average price of a Happy Meal is $3. A Switch costs $300. That’s a lot of Happy Meals before you start working at a loss.